From the Guardian UK, a story of jailed Palestinian minors. For a good look at the impact of children throwing rocks at soldiers on their communities, including the background of these uprisings and the viewpoint of Palestinians involved, I recommend Promises and Gaza Strip. I use both films in my cultural anthropology classes at Western Connecticut State University. As an American, I remember my own education into the Israeli/Palestinian conflicts when I traveled to the West Bank with a Palestinian friend in 1978. Before that visit, I only knew that 'PLO' meant terrorist: I did not understand the complexities of the 'occupation.' My view was of course shaped by the family with whom I stayed and was certainly a story of confinement. The first movie here, Promises, is directed by BZ Goldberg and tells the story of Palestinian and Israeli youth living no more than 20 minutes from each other but existing as if on different planets. Gaza Strip is by American documentary film maker James Longley, filmed in 2001. These are just two of the many moving documentaries available about this critical situation: check them out, see all perspectives, get informed. For the complete article, "Israel has detained 835 Palestinian minors in five years, says report", read below (after Gaza Strip video) or click here. Over the past five years, Israel's military has detained more than 800 Palestinian youths and children for pelting Israeli soldiers with rocks, and has interrogated and jailed many of them, a human rights group said in a report. Drawing on military statistics and interviews, Israeli rights group B'Tselem counted 835 minors taken into custody from 2005 to early 2011, including 34 children who were 13 or younger. In one case, B'Tselem cited the case of an eight-year-old who was seized in the West Bank in February. Soldiers released the boy after realising he was not the child they were after: they wanted his nine-year-old brother. They then handcuffed the nine-year-old, blindfolded him and took him to a detention centre where he was interrogated and held for five hours, according to the report. He was released after it was determined that he was a minor. 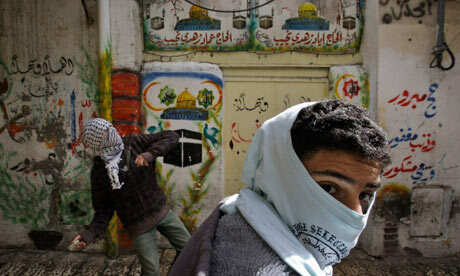 An Israeli military spokeswoman said around 160 civilians and soldiers had been hurt in violent attacks by minors. Of those, 10 were wounded by projectiles, but the spokeswoman, speaking of condition of anonymity, said she did not know the extent of their injuries. B'Tselem said night raids, handcuffing, blindfolds, interrogations and the denial of access to lawyers for children for hours at a time were frequently disproportionate. "The authorities need to enforce the law, but they should do it in lawful ways that are appropriate for the crime and the people committing the crime," said the report's author, Naama Baumgarten-Sharon. The Israeli military spokeswoman Lt Col Avital Leibovich said that in general the military handled children with sensitivity and their arrests were a justified response to violence. The B'Tselem report, released on Monday, noted the situation for child detainees had improved after the military built special juvenile courts, but said Palestinian minors were denied rights afforded to Israeli children. Israel has complained for decades about Palestinian children taking part in often violent demonstrations, claiming they are being exploited. Many Palestinian parents see their children as young fighters resisting Israel's occupation of the West Bank. Rock throwing, specifically, is seen as symbolic of their struggle. The issue has flared in the past few years as Palestinians hold weekly demonstrations in West Bank villages in which young men and boys pelt rocks and chunks of concrete at Israeli soldiers. Israeli soldiers have used teargas, rubber bullets and sometimes live fire in response, killing some demonstrators and badly wounding others. Of the more than 800 minors charged with hurling rocks over the past five years, only one youth was found guilty in a court trial. The other 93% were given jail terms in plea bargains, agreeing mostly because they feared being detained while they waited for their cases to reach trial, said Baumgarten-Sharon. More than 500 of the youths were around 16 years old, the report said. Another 255 were 14 and 15, and 34 were 13 or younger. The older the youths, the more likely they were to be given longer sentences, sometimes of months in jail. Leibovich said the responsibility lay with the children's families and Palestinian groups, whom she accused of sending out children to confront Israelis. "We are talking about minors that actually use rocks and explosive devices to target Israeli civilians and soldiers," she said.